We continue with the second part of Henri de Villiers’s article “Les chasubles pliés: Histoire et liturgie”, originally published in French on the website of the Schola Sainte Cécile. This translation of the article, done by Mr Gerhard Eger, is also being published simultaneously on Canticum Salomonis, with our thanks to him and to Henri once again for his generous permission to reproduce his work. THE DISAPPEARANCE OF FOLDED CHASUBLES? The generalized practice of cutting off the front part of the folded chasuble, which is certainly convenient, must have contributed to it being perceived as a vestment distinct from the celebrant's chasuble, which was certainly not so in the beginning. Paradoxically, this might have contributed to disaffection with its use. In 1914, the Jesuit Braun  deplored the disappearance of folded chasubles throughout Germany. 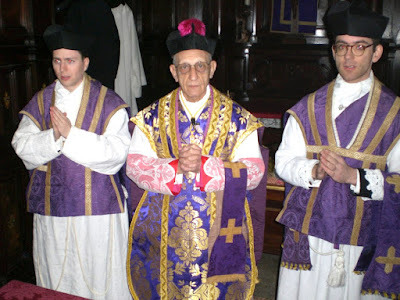 France was hardly better off at this time; although the published ceremonials continue to describe the use of folded chasubles, it is quite rare to find examples or even photographs of them in the 20th century. Their use seems to have endured more in Italy, in the Iberian Peninsula, and in the British Isles. Already suppressed for the Paschal Vigil in the new experimental liturgies of 1951 and 1952, folded chasubles were entirely banished from Holy Week with the 1955 reforms, and violet and black dalmatics and tunicles put in their place; folded chasubles were still to be used during the rest of Lent and other penitential seasons. This anomaly ceased with the publication of the new code of rubrics in 1960, which stated at the end of the general rubrics that "folded chasubles and broad stoles are no longer used” . Folded chasubles are one of the oldest characteristics of the Roman Rite; they go back to the time when all the clergy wore chasubles, and were retained for a most austere penance. Abandoning them makes a lie of the paintings in the catacombs. It is an immense loss, an outrage to history. They wrongly give this explanation to justify their misdeed: that folded chasubles are difficult to find. 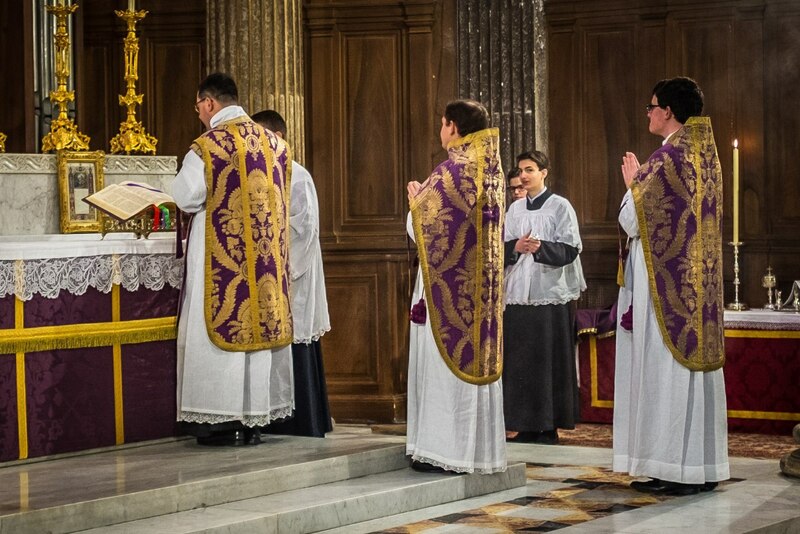 But the exact contrary is the case: one finds violet chasubles everywhere that can be folded, whereas violet dalmatics are much less widespread . Besides, one always has the option of ministering in an alb. We may add that it was a curious move to suppress folded chasubles at the same moment when a return to the ancient, more ample form of the chasuble was being promoted everywhere. On the other hand, the usage of folded chasubles was never interrupted among the Anglo-Catholics (and perhaps its usage will be gradually restored by the various new ordinariates erected to receive these communities into the bosom of the Catholic Church). In addition, amidst the renaissance of liturgical studies among traditional Catholic communities one observes a growing number of people who are restoring the ancient use. IN THE OTHER WESTERN RITES. 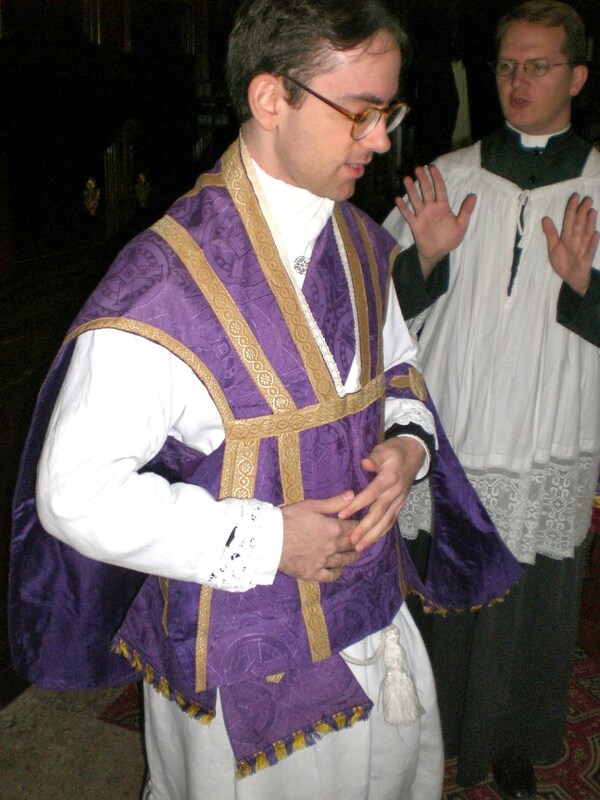 1) The Ambrosian Rite: Folded chasubles are used during Advent, Lent, and the Major and Minor Litanies (i.e. Rogation Days, which take place on the Monday, Tuesday and Wednesday after the Ascension in this rite, and during which ashes are imposed) and other fasting days throughout the year. 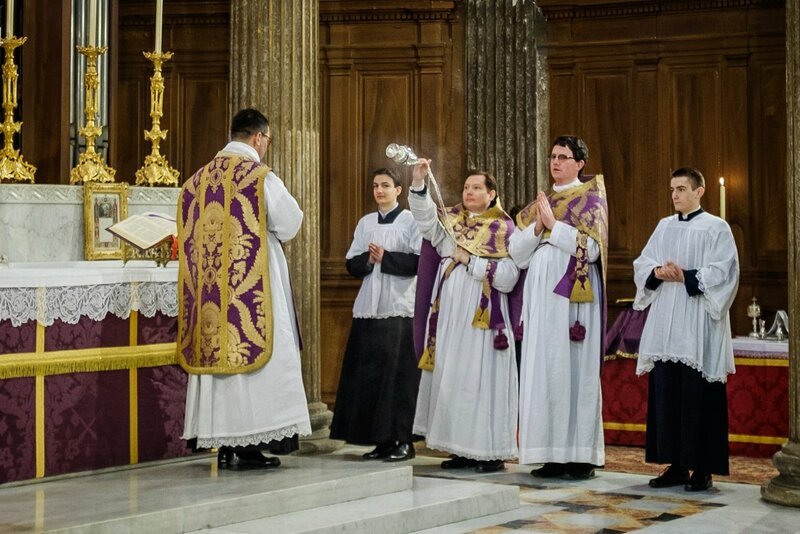 As in the Roman rite, the subdeacon takes off his folded chasuble to chant the Epistle. The deacon rolls his up crosswise in the Roman way from the Gospel to the end of Communion. 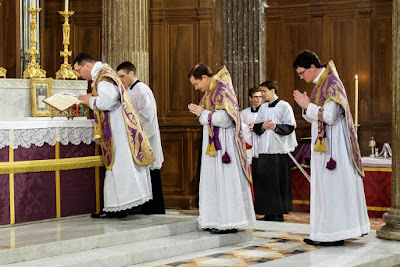 During Sundays of Lent, the deacon chants the very ancient litanies after the Ingressa at the beginning of the Mass; to do this, since it pertains to his proper ministry, he also rolls his chasuble crosswise. The liturgical colours differ from the Roman custom: dark violet during Advent and the Sundays of Lent, but the ferias of Lent are in black. The Major Litanies are in dark violet and the Minor are in black. During an exposition of the Blessed Sacrament on a day of penance, folded chasubles are obligatory, even in small churches. One notable difference with the Roman use is that during all of Holy Week (which begins on the eve of Palm Sunday, in Traditione Symboli) is celebrated in red and the dalmatic and tunicle are employed. 2) The Rite of Braga: The use is identical to the Roman rite, except for the procession of Palms when the dalmatic and tunicle are used. 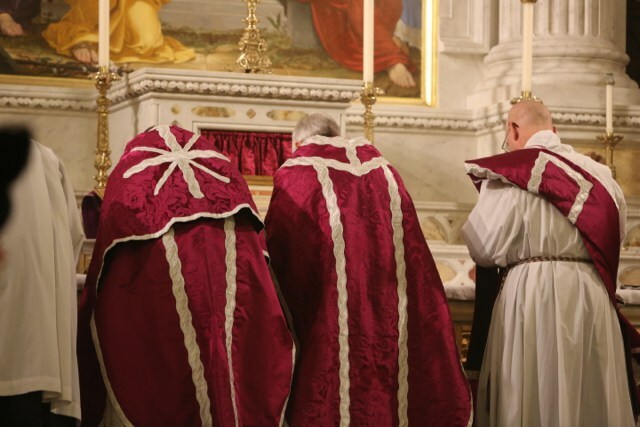 3) The Rite of Lyon: Very interestingly, folded chasubles are not used until after the first Sunday of Lent, a relic of the time prior to St Gregory the Great when the first day of the Lenten Fast was the Monday following this Sunday. The deacon takes off his chasuble before chanting the Gospel but does not roll it over his shoulders (so he does the same as the subdeacon at the Epistle). Folded chasubles are not used on Good Friday. 4) The Rite of Paris: Chasubles are not folded but rolled over the shoulders (the ceremonials speak of transversed chasubles: planetis tranversis super humeros). They are not used during Sundays of Advent, which are celebrated in white in Paris; rather the dalmatic and tunicle are used instead. Folded chasubles are nonetheless used during ferial Masses of Advent in bigger churches with many clerics; smaller churches are dispensed. Transversed chasubles are used for the first time on Ash Wednesday, then on Sundays of Lent, and on Good Friday; the vestments are black each time. On ferias of Lent, on the other hand, the deacon and subdeacon serve only in alb, stole, and maniple, without chasubles, even in the cathedral. 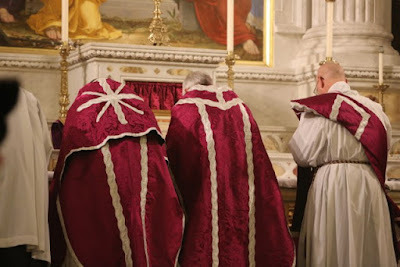 Ember Days in September are celebrated with red transversed chasubles, since these days belong to the Time after Pentecost, which is red in Paris. 5) The Premonstratensians: This rite has the interesting peculiarity that the use of folded chasubles begins on Septuagesima. 6) The Cistercians, Dominicans, and Carmelites: These three rites shares similar uses; during penitential seasons, the deacon and subdeacon serve in alb, stole, and maniple, as in smaller churches in the Roman rite. Note that in the Dominican rite, the dalmatic and tunicle are not used during ferial Masses throughout the year. 7) The Carthusians: This rite is very pared down and does not employ the dalmatic and tunicle at all during the year. During Mass, the deacon only puts on the stole to sing the Gospel. Folded chasubles are therefore not used at all. Based on the evidence from ancient artistic representations, the Byzantine East used the chasuble since at least the 5th century; it is called φαιλόνιον in Greek (phelonion, similar to the Latin pælonia). Theophilus of Alexandria. 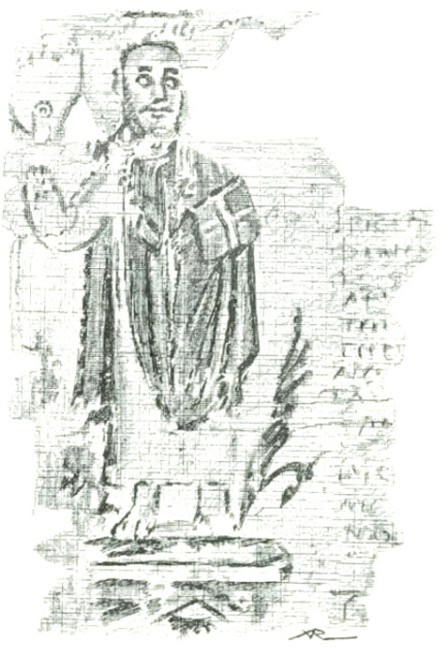 Miniature on papyrus, 5th century. By an interesting development similar to the one that happened in the West, the front part of the phelonion is cut in such a way as to facilitate the gestures of the celebrant. Icon representing St John of Novgorod: the phelonion is held folded over the arms. 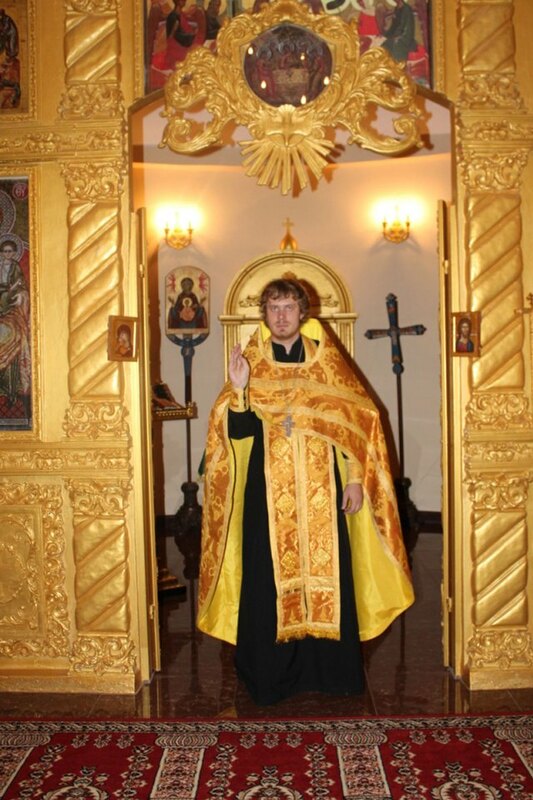 A Byzantine priest wearing the phelonion. The front part of the vestment is cut to facilitate liturgical gestures. Certain Spanish folded chasubles have a shape very similar to that of modern-day Byzantine phelonia cut in the front. Spanish-style folded chasubles, very similar to the current Byzantine cut. 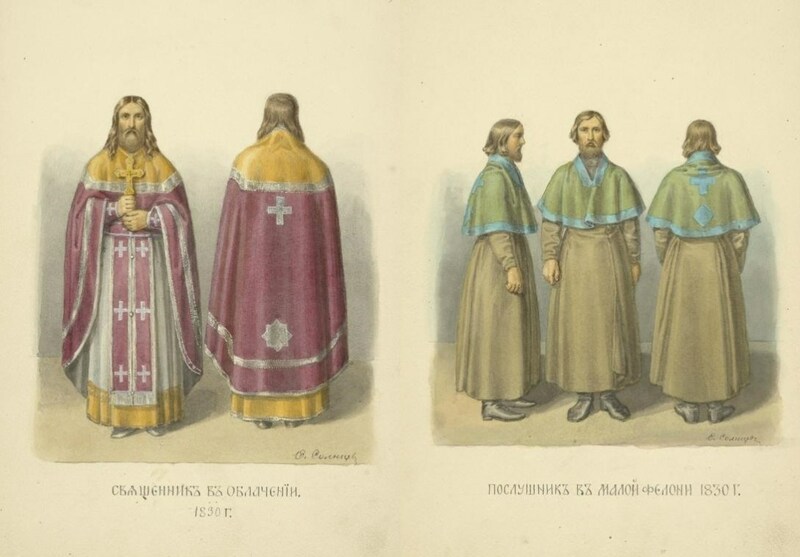 We nevertheless do not find any evidence that deacons and subdeacons ever wore chasubles in the East; both used dalmatics) . 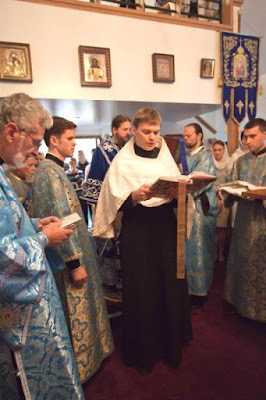 Yet, in the Russian use, during the ordination of a cantor or lector, the bishop puts a short phelonion over his shoulders, which is likely the Eastern equivalent of the Western folded chasuble. 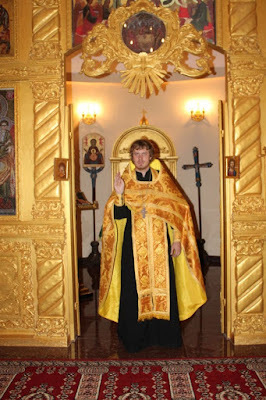 Ordination of a lector in the Russin use. The short phelonion is then taken off once the lector has chanted an Epistle. A newly-ordained Byzantine lector wearing the short phelonion sings the Epistle. During the ordination of a non-monastic subdeacon, the candidate presents himself before the bishop wearing a short phelonion. This vestment is not used outside these two ordinations , but it might well be a remnant of a more ancient custom where the chasuble was worn by the minor clergy. Russian phelonion and short phelonion. Mass in the Armenian Rite (Armenian Catholic Cathedral of Sainte-Croix in Paris). Mons. Bugnini’s enthusiastic efforts to suppress folded chasubles (he notes with disdain that no one will miss them)  gives rise to a larger question that naturally emerges when one studies the liturgical reforms of 1951-1969. These reforms were presented to the faithful at that time as a welcome return to the liturgy of ancient Christianity, finally purified from the dross of the High Middle Ages and the Baroque era. But if that is the case, how are we to explain the contemptuous suppression of this truly ancient element of the Roman Rite that is the folded chasuble, a precious custom that unites us to the prayer and practice of our forefathers in the faith, going back to the earliest centuries? Alas, this particular example is far from unique, and it only highlights the abandonment of numerous ancient elements in favor of the purely imaginative constructs that took place during these reforms. 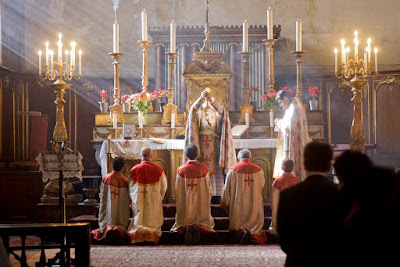 More globally, one might ask about the nature of the liturgical reform of 1951-1969: does it constitute a continuous organic development of the liturgy of the Church or a radical rupture with the centuries-long praxis of the Roman Rite? 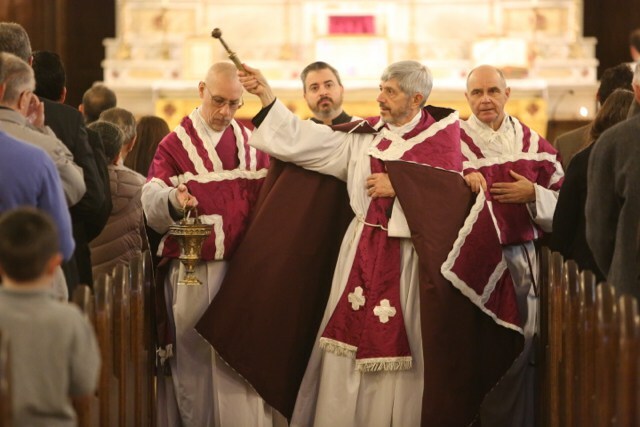 It is interesting to consider how in different parts of the world, traditional communities are starting to take up the use of folded chasubles. We are certain that these communities perceive that they form a part of the symbolic richness that the tradition has bequeathed to us and of which we have been unjustly deprived. Mass of Mons. Angelo Amodeo in the Pantheon, Rome. The Passion according to St Matthew. 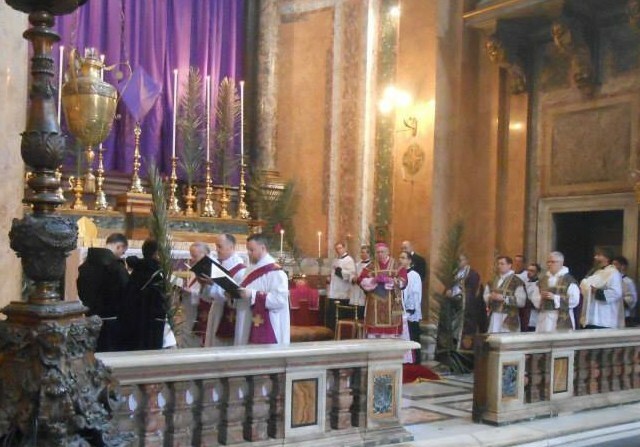 Pontifical Mass on Palm Sunday, Rome. Second Sunday of Lent 2016, collegiate church of Saint-Just in Lyon. 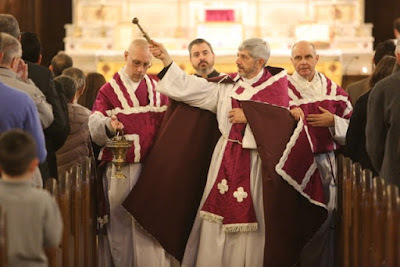 The Asperges, Second Sunday of Lent, Society of St Hugh of Cluny, Connecticut. Note the transversed chasuble that is actually rolled, Second Sunday of Lent, Society of St Hugh of Cluny, Connecticut. Distribution of candles in Candlemas 2016, Institute of Christ the King, Gricigliano. G. Braun, Die liturgischen Paramente, 1914, p. 98. Rubricae generales XIX, n. 137: Planetae plicatae et stola latior amplius non adhibentur. Indeed, strictly speaking violet dalmatics and tunicles are only used on the three Sundays of Septuagesima, Sexagesima, and Quinquagesima. This very often retains structures much more ancient than the Greek usage. 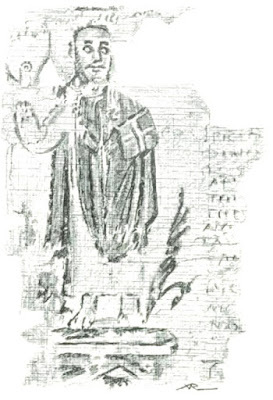 The lector-cantor ordinarily uses a type of tunic for his office, the sticharion—στιχάριον. Certain parishes have tried to restore a more frequent use of the short phelonion. According to R. Pilkington, I riti orientali, Turin, L.I.C.E. —Berruti, p. 31. Cf. A. Bugnini—C. Braga, Ordo Hebdomadae Sanctae instauratus commentarium. Bibliotheca Ephemerides Liturgicae Sectio Historica 25, Roma, Edizioni Liturgiche, 1956, p. 56, n. 28.